Vertebrate animals have two immune system mechanisms to specifically identify and remove infectious agents from the body. In humoral immunity, proteins called antibodies bind to the foreign invader, targeting it for destruction by nonspecific defenses. In cell-mediated immunity, immune cells directly attach to and destroy the invader. Both mechanisms require the actions of T cells. T cells belong to a category of white blood cells called lymphocytes. Lymphocytes are slightly larger than red blood cells and are found in the blood, lymphatic organs, and many other structures in the body. The spleen, lymph nodes, and tonsils are examples of lymphatic organs. Lymphocytes have large, round nuclei that take up almost all of the space inside the cell. Other examples of lymphocytes include B cells and natural killer cells. Like all blood cells, T cells are made in the bone marrow. The T is an abbreviation for the word "thymus," an organ found on the front of the trachea, near the lungs and heart. After T cells are made, they go to the thymus to become mature. Three important events occur in the thymus. First, each T cell begins to produce a protein called a receptor on its cell surface. T cell receptors recognize antigens , which are molecules that can start an immune response. Foreign invaders are made of many antigens. An antigen can fit inside the T cell receptor much like a key fitting into a lock. Each T cell receptor recognizes only one type of antigen. This explains how the immune system specifically identifies foreign invaders. As a T cell matures, the genes that contain the information on how to build the T cell receptor are rearranged. Millions of possible T cell receptors can be produced by this rearrangement. However, once the genes are rearranged, a given T cell is committed to making only one type of receptor. Scanning electron micrograph of three T cells. in the thymus is the destruction of these T cells. This process is called clonal deletion. The surviving T cells can roam through the body's organs, searching only for invaders. The third event that occurs before the T cells leave the thymus results in the production of T cells with different functions. Some of the T cells will produce a surface protein called CD4. These T cells are called helper T cells (T H cells), T4 cells, or CD4 cells. As their name implies, T H cells assist other immune cells. Other T cells in the thymus produce a surface protein called CD8. These T cells are called cytotoxic T cells (T C cells), T8 cells, or CD8 cells. As their name implies, T C cells destroy foreign invaders. Some CD8 cells seem to be able to control the immune system and are consequently called suppressor T cells. T H cells function in both humoral immunity and cell-mediated immunity. If foreign antigens enter the body, cells called antigen-presenting cells (APCs) engulf the antigen and attach it to a molecule called a class II major histocompatibility complex (MHC) protein. The antigen and class II MHC protein are then moved to the surface of the APC. The APC presents these molecules to a series of T H cells with different receptors. If there is a match between a T H cell receptor and the antigen, the T H cell is stimulated to divide rapidly and produce chemicals called cytokines. The CD4 molecule on the T H cell connects with the class II MHC protein on the APC to stabilize the cell-to-cell connection and provide additional signals. There are many other molecules on the surfaces of these cells that must interact, showing the complexity of the process. 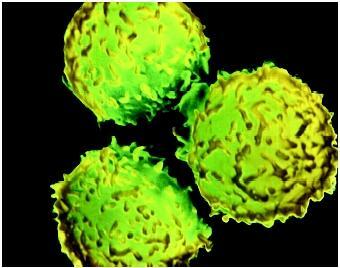 T H cells interact with B cells and T C cells to protect the body from infection. stimulates the B cell to divide rapidly, and it produces antibodies. Antibodies can clear other copies of the foreign invader from the body. In cell-mediated immunity, stimulated T H cells activate T C cells. All cells of the body produce surface proteins called class I MHC proteins. If the cell is abnormal (cancerous or infected with a virus), the abnormal antigen is displayed with the class I MHC protein. A T C cell with the matching receptor will recognize the abnormal cell. The T C cell receptor binds to the abnormal antigen and the CD8 molecule binds to the class I MHC molecule. 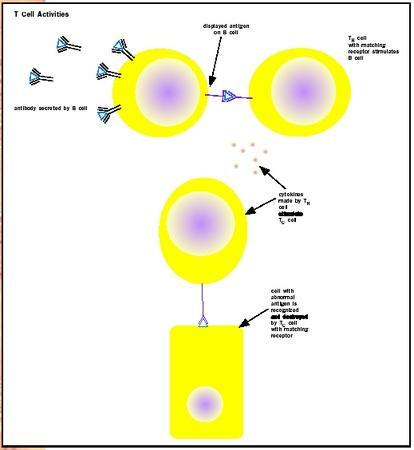 The T C cell receives other signals from cytokines made by T H cells. Now the T C cell divides rapidly and searches for other abnormal cells. When the T C cells find abnormal cells, they bind to them and release chemicals that destroy the target cell. Perforin, lymphotoxin, and tumor necrosis factor are examples of these chemicals. Both B cells and T C cells can become memory cells. Memory cells eliminate an invader more quickly if it appears again. T H cells also aid nonspecific immunity by producing cytokines that cause inflammation and attract and activate white blood cells such as neutrophils, natural killer cells, and macrophages to the site of infection. T cells may function abnormally, causing a variety of medical problems. For example, human immunodeficiency virus infects and destroys T H cells. Consequently, many T C cells and B cells are not activated. The invader gets the upper hand, and the body cannot easily rid itself of the infection or abnormal cell. Sometimes T C cells overreact to a harmless antigen and damage healthy tissue. This is what happens in individuals with allergies to poison ivy, latex, cosmetics, and metals. T C cells are also responsible for the rejection of a transplanted organ. Nossal, Gustav J. "Life, Death, and the Immune System." Scientific American 269, no. 3 (1993): 53–62. CD4 cells are occupied by hiv cells.cd8 cells are used as anti viral treatment to destroy teh virel infected cells.Even though immune is going to week.so is there any way to control this attack on cd4 cells and prevent loss of rd4 cells?Can we use any other kind of cells which can be replased by cd4 cells and rasist to hiv cells and foren cells?If so we can cure hiv?